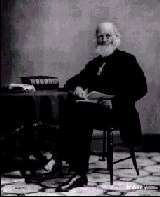 William Cullen Bryant was an American poet whose works were often based on themes of nature. In his poetry, Bryant often used nature to represent God. He felt that, as a poet, he was obliged to improve the moral values of his readers, and consequently his work is frequently criticized for its pedantic, moralistic tone. Bryant's father was Peter Bryant, a physician, and his mother was Sarah Snell Bryant. The family lived in the house of the Snell grandparents. Bryant grew up with the diametrically opposed views of his Unitarian father, a member of the state legislature, and his grandfather, a stern Calvinist farmer and a deacon of the local church. His parents tutored him in Greek and Latin at an early age, and he spent many hours absorbed in books from his father's library. When he was only thirteen years old, Bryant published his first work, The Embargo, which attacked President Jefferson and called for his resignation. The endless hours Bryant spent in the countryside near his home, influenced his poetry. Early on in his writing, he moved away from heroic couplets toward a romantic style that has been compared to that of Wordsworth. His best-known work, Thanatopsis, was written while he was still a teenager. This poem expresses the thought that a man can die confident that he will be saved by faith. Because of the Unitarian nature of the poem, Bryant secreted it away from his grandfather and published it anonymously in The North American Review in 1817. Although the poem wasn't a popular success at the time, it did obtain the attention of the editors. Bryant wanted to attend Harvard, but this was an extravagance that his grandfather wouldn't condone. Therefore, when he was fifteen, Bryant spent one year at William's College and then returned home to study law privately. After being admitted to the bar at the age of twenty-one, Bryant spent the next ten years practicing law. His heart wasn't in his work, however, and he diverted himself by writing poetry. In his mid-twenties, Bryant married Frances Fairchild. They were happily married and had two children. One year after his marriage, he published another well-known work, Poems, which he was invited to read at Harvard in 1821. In 1825, he became the co-editor of the New York Review. In 1826, he became an editor for the New York Evening Post, followed by a post as editor-in-chief in 1829. Later, Bryant became part owner of the paper. As a journalist, he advocated free trade, free speech, the rights of workers, and the abolition of slavery. He was a key founder of the Republican party and a partisan of the Union cause during the Civil War. Bryant's contributions to the literary field were made primarily in his youth. After 1830, writing poetry became a hobby, rather than a livelihood. Although he completed many volumes of works, none are of the same critical merit as the work he produced in his teens and twenties. He is, however, noted for his translations of Homer's Iliad in 1870 and Odyssey in 1871.